It is true that Kopf’s novel is unconventional. So much so that it raises questions over whether it is even apt to term such a hybrid work a novel. 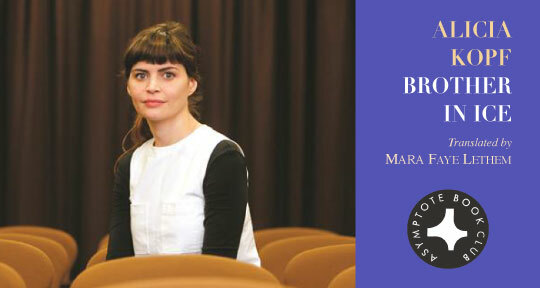 According to publishers &OtherStories, it is ‘part research notes, part fictionalized diary, part travelogue’—and whilst that is how the tripartite structure of Brother in Ice may be understood, Kopf’s systematic scribbles gesture past these categories. Indeed, preceding the text, and acting as a preface, are two pages of small illustrations—all of which belong to Kopf’s own visual installation Diario de Conquistas (2014), exhibited in Barcelona’s La Capella. This formal decision, though unannounced, subtly foregrounds the intrinsic relationship between the author’s visual and literary production, but also, in a broader sense, between the image and the printed word, which often complement one another throughout the text. It is in this light that we as readers might understand, for example, the impact of the phrase ‘Around the world’, taken from Daft Punk, when printed multiple times in white letters against a black background, amidst slanted exclamation marks, rooted as it is in Kopf’s profound awareness of the undeniably visual nature of the printed word. 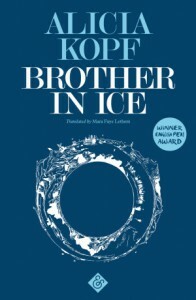 And it is in these moments throughout the narrative that Brother in Ice truly feels as if part of a wider project—an ‘exploration of exploration’, as Kopf herself defines it. Ultimately, through all these systematic detours—which interweave effortlessly, and in almost homeopathic doses, fragments of history with patient reflections on the narrator’s poignant relationship with her family and, more specifically, her autistic brother—Kopf’s readers, aided by Lethem’s seamless translation, will find that they have undertaken a real journey.